An unrelenting hacking echoed off the walls of the Cathedral and as Prince Aiden made his way through its depths, the sound only grew louder. There were no screams; just that dreadful sound... over and over. 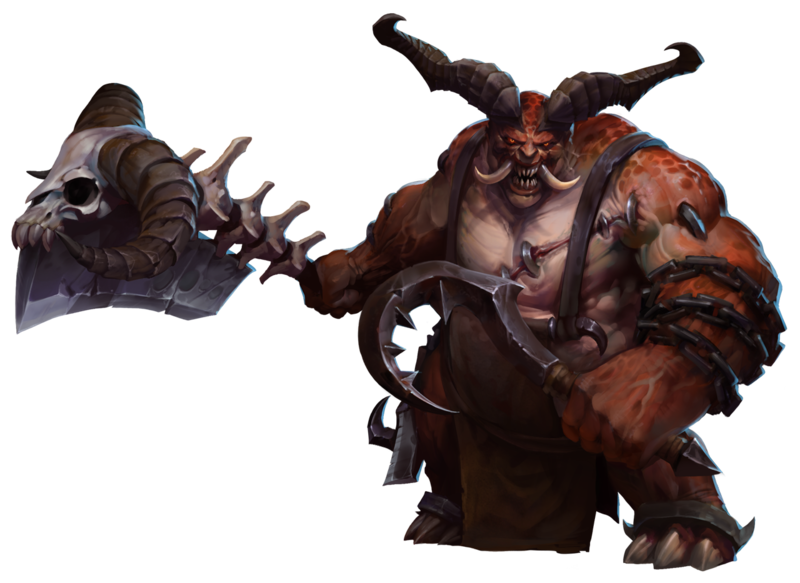 The Butcher is a monster in Heroes of the Storm and a welcomed addition. As an assassin, he is a powerful duelist and roamer. In terms of securing a kill, he is on par with Illidan and Zeratul; if not better. As is stands, The Butcher is my new favorite buddy. With the ability to charge in and smash an enemy target in a matter of seconds, you will become the bane of many players in no time. Nearby Minions drop 1 and Heroes drop 3 Fresh Meat when they die, which you can pick up to gain 1% bonus Attack Damage. Can hold up to 25 Meat. All Meat is lost on dying. Deal 40 (+10 per level) damage and slow enemies by 49.92% fading over 2 seconds. Your next Basic Attack will strike immediately. Deal 30 (+2.5 per level) damage to an enemy and cause your Basic Attacks against them to heal you for 75% of the damage done for 5 seconds. Healing doubled versus Heroes. Charge at an enemy, becoming Unstoppable and gaining Movement Speed. If you reach the target, they are stunned for 1 second and take 60 (+10 per level) damage. After a 3 second delay, fire explodes around you dealing 300 (+35 per level) damage to enemies. Can be cast while using Ruthless Onslaught. Throw a hitching post that attaches to the nearest enemy Hero after a 1 second delay. This deals 75 (+15 per level) damage and causes the enemy to be chained to the post for 4 seconds. Unlike a number of heroes, The Butcher is surprisingly balanced. Currently, he is sitting at a 51% win rate, and within that the vast majority of his talents all have an equal win rate to each other. Because of this, players can go with almost any talent build they want; though it is advised that you keep some level of coherency between them. In this guild I'll be highlighting my favorite talents, and why I prefer them over the others. If Hamstring hits a Hero, half of the Mana cost is refunded and the cooldown is reduced by 1 second. Periodically reduces the damage received from Hero Basic Attacks by 50% . Stores up to 2 charges. Increases the damage of Hamstring by 50% to non-Heroic targets, and Minions killed by Hamstring drop 3 stacks of meat. Heal for 3% of your Maximum Health when you collect Fresh Meat. Meat continues to drop at maximum stacks. Increases the length of Hamstring by 40%. Reduces the cooldown of Ruthless Onslaught by 40% upon impact. Hamstring does 100% more damage to targets affected by a slow, root, or stun. Activate to poison an enemy Hero, dealing 209.88 (+29.92 per level) damage over 10 seconds. After using Hamstring, your next Basic Attack deals an additional 50% damage. Increases Butcher's Brand's healing from 75% to 100% of your Basic Attack damage. Increases the maximum number of Fresh Meat to 35, and you only lose half upon death. Increases Ruthless Onslaught's range by 33.333333333333%, and causes you to lunge at the enemy when close to impact. Deal 12 (+2 per level) damage per second to nearby enemies. Ruthless Onslaught deals bonus damage to Heroes equal to 15% of their current Health. While an enemy is affected by Butcher's Brand, you gain 30% Movement Speed. Upon taking Ability Damage, reduce that damage and further Ability Damage by 50% for 3 seconds. Can only trigger once every 30 seconds. Hamstring's slow no longer fades out, and the duration is increased by 25% . Receiving damage that reduces you below 50% of your maximum Health causes you to become Enraged for 10 seconds. You gain 40% Attack Speed and reduce the duration of slows, stuns, silences, and roots against you by 75% while Enraged. Fresh Meat also increases your Attack Speed by 1% per stack. Furnace Blast explodes a second time 3 seconds after the initial explosion. Lamb to the Slaughter now chains all enemy Heroes in range. Basic attacks deal 20% more damage and slow the target for 1 second. Activate to teleport to a nearby location. The following is a collection of talent kit layouts; each with it's own merits depending on the style of play and the skill of your team. The AI can be silly at times and, unlike most human players, is happy to stand there and let you hit them a few times before running away. For that reason I recommend Furnace Blast and Burning Rage. More damage, more burst, easier wins. This build is meant to split push all day. Lamb to the Slaughter fills the heroic ability slot as an emergency precaution. If one or two enemies are coming after you post one of them down, and keep your health up with butchers brand. When they die, move in to kill the other one; if they aren't running away. While you should spend the opening minutes of the fight killing minions, getting meat, and gaining experience, you can really start doing damage at level 7 and take on Siege Camps by yourself. Time to shine. When you are working together as a team from the start, you may need to sacrifice some of your damage output for utility. The following builds are powerful in coordinated team play. Now it's time for math. Math for the Math God! Numbers rounded to nearest hundredth after the fact. In this table we see the damage output of The Butcher, at Level 20, with a number of different builds. With the first being his base stats, the remainder with values of Fresh Meat (Meat) and whether or not he has the Blood Frenzy(BF) and Nexus Blades(NB). In addition, I've includes the damage of a burst attack with Hamstring(HS), Lamb to the Slaughter(LttS), and Envenom. Now the best part of this character isn't just how much damage he can deal in a short amount of time, but how much we can heal while doing it. When you sling Butcher's Brand onto an enemy hero before giving him a good walloping, here is the kind of damage and healing you can expect to get. The numbers don't lie; The Butcher is exactly as his name suggests. In less than 5 seconds he can kill everything but the heaviest tank in the game and walk away with full health when he's done. The bread and butter of this assassin. Run in, lock them in place, and smash them to pieces. Also works well without using Lamb to the Slaughter, but it is recommended you only do this against targets that lack any good escapes. When charging in with Furnace Blast you should active it before Ruthless Onslaught. Three seconds is a long time to wait, and a charge at maximum vision is less than 2 seconds; so firing it off during the charge might result in your target escaping before it goes off. Early game Butcher is all about getting experience. It is also important to remember that running into any fight with less than 25 Meat is a poor idea and should only be done with backup. You are fairly good as a poker early on with Ruthless Onslaught, popping Butcher's Brand, and bursting them with a few Auto-Attacks and Hamstring. It is important to understand that early on you won't be getting any quick kills and you don't want to chase them into their towers; that will be your end. Just get in, do a bunch of damage and let them run. They will be losing time and experience in their absence, and you can help your minions by getting them in to absorb tower ammo. It is also very important that you try not to die. I know this is a silly thing to say, but until you acquire Abattoir death is a very large penalty on your Meat numbers; undoing minutes of work. Now you are a threat to everything in the game. Once you have unlocked your Heroic Ability you should begin roaming the map in search of easy prey. If your team is doing well, this might mean going around an collecting all the mercenaries or killing any would be gankers trying to get around your team. If your team is falling behind in levels or forts, you can attempt to gank their back row in a team fight or going after a pusher that is knocking on a second tier gate by themselves. When you hit level 16 and get Blood Frenzy you can start soloing bosses, directing the flow of team fights, or smashing down every structure that have left. Level 20, the promise land. If you have beaten the enemy team to level 20 it is time to get aggressive and fill up their waiting queue. Always beware of getting in too deep or team fights with a lot of stun. If you find yourself unable to get into a team fight because of the impending doom, consider split pushing. As The Butcher, with just a hand full of minions at your side you can work through to the enemy core in very little time; making the enemy team consider coming after you. If you can pull just one enemy out of a team fight this way you have done your job. Fighting with the enemy team is the true test of any player. Fortunately, you are playing The Butcher and delivering the enemy team one hell of a beating is your primary purpose. The main things to focus on with this character is estimating enemy team ability usage and which targets to go after. It is advised that you only play with your Hamstring at first or stay out of poke range for the opening of the fight. You really want to avoid taking damage early on, as you will need all you can get to charge into the enemy team. Once the majority of the enemy team has used their abilities, it's time to start picking out a target. Your target should be either a high damage dealer, healer, or any character that is in too deep. Once you are ready, and your team isn't about to run away, charge in an unload on the poor sap. At this point always be ready to run first and foremost. If your team goes in with your momentum you will want to return to the middle or back of the pack anyway, so taking a couple of steps back won't harm your position. As with all team fights, building your test cases and gaining experience is the best way to learn and augment your strategies as every fight is different than the last. As an example of changing up the combo in the heat of the moment, I will tell a quick story. In a 5 on 5 team fight, the enemy team had a Falstad and Brightwing. Right after Brightwing used Polymorph against one of my teammates, Falstad came in to try to take that hero out. When he came in he was close to my range for Lamb to the Slaughter, so instead of charging him with Ruthless Onslaught I just cast and posted him with LttS. Knowing my team could quickly kill a posted Falstad, I charged into Brightwing, and within a few seconds both of them were dead. Really, in the end thought, it's just understanding and experience that will define your team fighting ability with any character; so keep trying new things and learn from your mistakes. Matching up against The Butcher is no easy task, and you can find yourself sitting next to your towers for safety. Here is a list of heroes that stand a good chance against The Butcher, and a few that make great allies to him. The ranged mages of nexus are your biggest treats. Jaina is a glass(ice) cannon and an easy picking when she is by herself. However, if you attempt to take her on unprepared she will kite you with Frostbite. Kael'thas with his Gravity Lapse and quick damage output will cause you the same problems. Be it Safety Bubble or Divine Shield, both Murky and Uther have the ability to deny your primary abilities. Beside the fact that it's a waste on Murky, you should not pick either of these two enemies as your target of choice. Oddly enough, the most powerful allies The Butcher can have are the same ones that serve as his greatest threats. Each of these character has a way of locking down or slowing an enemy target for an extended amount of time. Jaina with her Ring of Frost, Kael'thas with Gravity Lapse, and Murky with Octo-Grab. Uther has a special place with The Butcher. When you have this team setup, The Butcher should always go with Furnace Blast and Spell Shield, and Uther with Divine Shield. With this combo, you remove The Butcher's main weakness of entering a team fight. By charging in under the protection of the Divine Shield, you can guaranty the firing of Furnace Blast, as well as a few follow up auto-attack before anyone has a hope of stopping him.